This outdoor shower post is sponsored by Outdoor Tankless. I received an Eccotemp L5 Tankless Water Heater for reviews purposes. 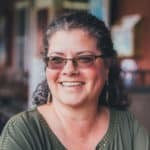 One of the certainties about a life that includes chickens, a garden, and seemingly never-ending weed whacking is that we tend to get dirty. Sometimes really dirty. 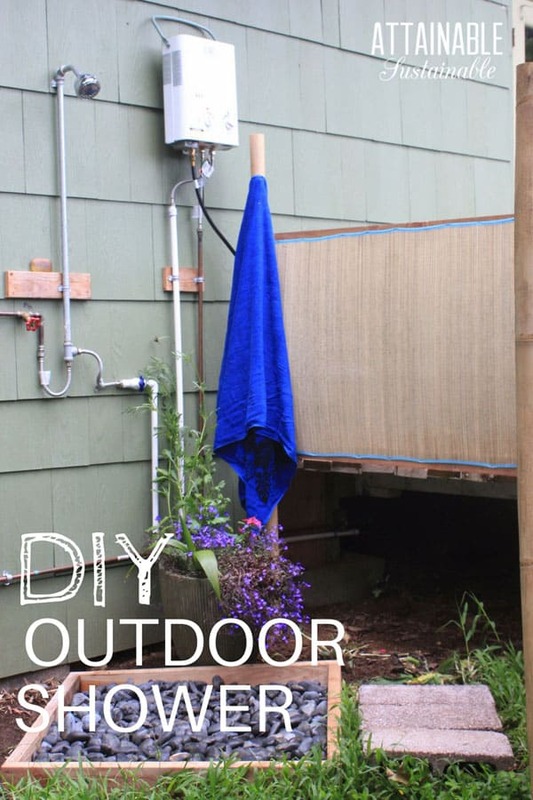 Enter our outdoor shower. You know how sometimes the stars align and just the thing you need shows up at just the right time? When Joel from Outdoor Tankless contacted me, asking if I’d like to demo an Eccotemp L5 Tankless Water Heater, I thought, yeah. Yeah, I do. 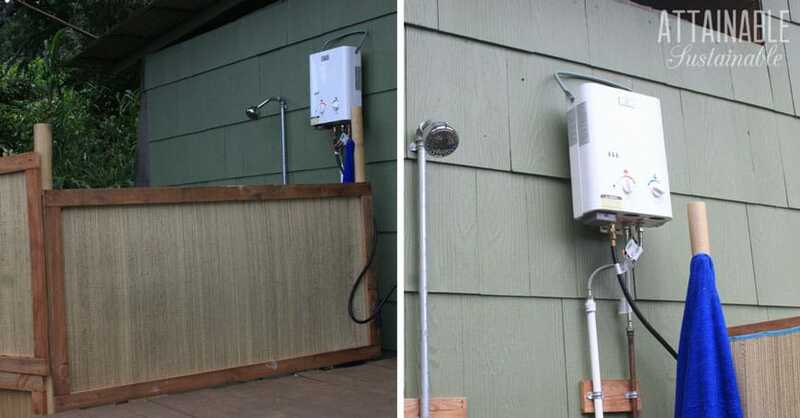 We opted to set up the outdoor shower station attached to an outbuilding. It’s on the protected side of the building, under an overhang so it’s not too exposed to the weather. This spot is tucked away enough that there’s a certain amount of privacy. My son created several panels to create a screen on two sides of the shower area, giving us three “walls” and one open side for access. We debated a lot of different materials for those panels. We discussed using the strawberry guava and bamboo we have on site. Ultimately my son went for the fast option: grass beach mats. They work well as a screen and they were easy, but it’s becoming apparent that they are a short-term solution. Between the wet shower area and our humid climate, there’s already mildew appearing on the mats. 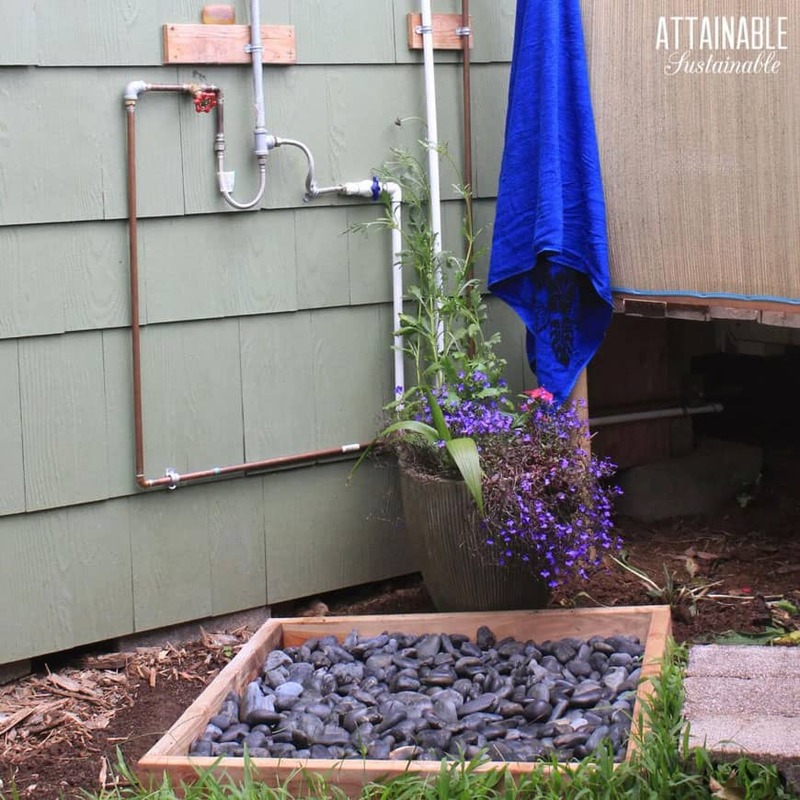 Utilize the roof of the outbuilding to capture rainwater and run the outdoor shower off of catchment water. Tie into the existing plumbing that was about 60 feet away. While I was a proponent of the catchment idea, the quasi-plumbers who were in charge of this project (my son and my husband) nixed that idea as too complicated. We tapped into the house plumbing. This water heater is portable and could easily be used for a camp shower. It can be hooked up to a standard garden hose. It comes with an attached shower head for almost-instant gratification. We wanted something a bit more permanent. My son plumbed the hot and cold water from the tankless water heater to a mounted shower head. 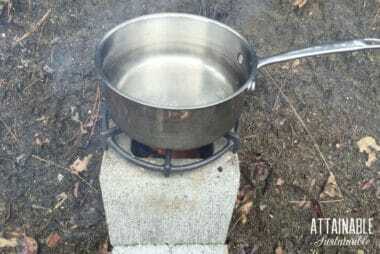 It’s connected to a portable propane tank that does the magic work of heating the water. We didn’t want this outdoor shower to turn into a huge production. It would be good to be able to walk away from it without mud on our feet, though. A simple frame made of two-by-fours and filled with river rock did the trick. The shower area is on a slight slope, and the ground at one side of the enclosure slopes away from the shower area on a steeper incline. We simply dug a shallow ditch to encourage draining. The nearby banana plants benefit from the runoff. Several CMU blocks adjacent to the shower provide a platform on which to dry off and get dressed. We’ve been impressed with the amazing heat that this water heater produces. It’s a bit different than using a regular shower with hot and cold shower knobs. Instead, there are water on and heat on dials. We turn the propane tank on and off as we need it, rather than leaving the valve open all the time. We do have occasional issues with the wind blowing out the pilot light. When this happens, it requires that we turn the water off and then back on to get it fired up again. Note that the instructions with the tankless water heater expressly state that this is not intended as a permanent installation. The Eccotemp L5 Tankless Water Heater is available in various configurations.